Hazelet's Journal is a timeless story about a restless nation and the great American spirit upon which it was founded*. It's a true American story un-edited, told in the journalist's original voice now captured for generations to come. George Cheever Hazelet, inspired by the great tycoons at the dawn of the Industrial Age, became one himself in the chicory-coffee market. But the markets crashed and coffee became as cheap as the dirt the farmers were trying to cultivate. In the midst of this calamitous financial crisis of the late 1890s, he turned to the one opportunity that played no favorites the Klondike Gold Rush. Hazelet was one of the adventurous souls who went to Alaska in 1898 to seek his fortune. He carved his own path across frozen tundra and snow-covered glaciers to a valley in Alaska rarely seen by a white man. Here he found not just gold but coal and oil and rich shafts of copper whose size promised breathtaking fortunes. It was a valley that would become a symbol of hope for some, despair for others, and lost opportunity for powerful men who did not like to lose. This last frontier was known as the Copper River Country. It was here that Hazelet set his sights on a new beginning in Alaska. Carrying with him the hopes of his family and friends back home in Nebraska, he set out to stake his claim to the gold that seemed plentiful as rain. He remained in Alaska to become a respected business and civic leader. With his close friend and partner Andrew Jackson Meals, he would figure prominently in the development of both Valdez and Cordova. He would meet the titans of industry, two sitting U.S. Presidents, and he would later become the first mayor of Cordova in 1909. EDITOR: John Clark received a BA in fine arts from the University of New Mexico and founded and ran a printing and manufacturing company located in Louisville, Kentucky for twenty-seven years. Today, he is the president of the Port Valdez Company, which traces its land holdings to George Cheever Hazelet and his partner Andrew Jackson Meals original scripting of 720 acres in Valdez, Alaska, at the turn of the twentieth century. He also is the founder of Old Stone Press. He and his wife, Gretchen, live in Louisville, Kentucky. 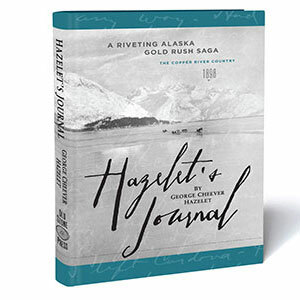 George Hazelet was a Nebraska school teacher who had the guts to take on the untamed wilds of Alaska in search of a new life for his family. The story takes you from forest fires, earthquakes, months spent on the trail to the ruthless world of claim jumpers and last-chance gold rushers. It was impossible to put it down."